In most big brands, two of the most important location-based technologies, Wi-Fi and iBeacon are working together to drive IoT growth. With an array of location-based technologies (NFC, GPS, Wi-Fi, BLE) available, both consumers and businesses are facing an urgent need to identify the distinguishable features of these technologies. Many comparative studies such as iBeacon vs NFC vs GPS, Li-Fi vs Wi-Fi vs BLE, and so on, undoubtedly provide assistance in understanding their usage. Two of the most popular among the bunch of location-based IoT technologies, Wi-Fi and iBeacon, also come out as the top choices among them for businesses and consumers. To start, let’s understand the differences between these two technologies. Any interaction between a beacon and a smartphone is done via Bluetooth. While the two devices communicate, phone battery experiences minimal power loss. Studies show that Bluetooth devices have low power consumption than Wi-Fi devices due to the broadcast range of the two technologies. Bluetooth uses less than 3% of the power required by Wi-Fi for the same tasks. Thus, a smartphone device saves a lot more battery power while interacting with a BLE beacon than with a Wi-Fi hotspot. 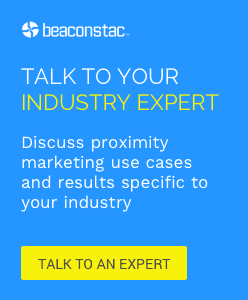 The US has 20 million beacon compatible smartphones. 80% of iPhones are compatible with beacons while this percentage is around 20% in the case of Android devices. According to statistics, the US has 188 million Wi-Fi compatible smart devices. 52% of Android phones, 42% of iPhones and 7% of other smart devices are compatible with Wi-Fi. Every implementation has three steps: installation, app development, and management. In the case of beacons, both installation and management are easy as compared to the app development stage which is a crucial juncture. A business can either go for a beacon-enabled third-party app or use an SDK to beacon-enable its own app. Contrary to this, there is no app development involved with Wi-Fi implementation. Its installation stage takes up more time and effort than its management stage. 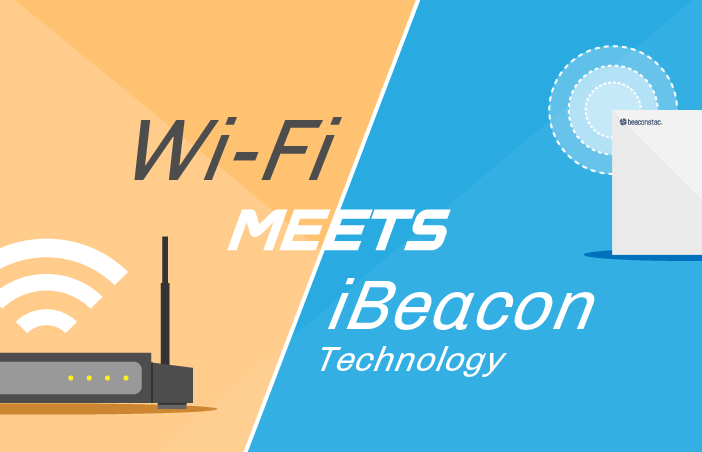 Can Wi-Fi be used in combination with iBeacon technology? As mentioned in our earlier post, Wi-Fi and beacons work best when used together given the differences and similarities between them. For instance, you can provide Wi-Fi to a consumer for navigational purposes at the location of a venue and use beacons for proximity-based interactions inside the venue. In the same light, imagine a scenario in which these two technologies are used in combination. It transmits signals like any other beacon to push notifications and relevant information on a smartphone. It works as a Wi-Fi router and connects consumers to the internet while operating as a Bluetooth transmitter. This access point communicates with all the Bluetooth and Wi-Fi devices in its vicinity to collect information and sends it to the cloud-based fleet management tool. There are many beacon hardware providers in the market today. All beacons transmit a signal containing a packet of data. Some of these beacons transmit only their UUID, Major and Minor, and information like location and temperature in that packet, while others transmit additional information like battery and health, transmission power, and advertising interval in the same packet. In case of the former kind, you will need to go to the beacon, connect to it via a smart device to receive that additional packet of information and then make changes to the beacon properties if required. In the case of latter, this packet of information is sent to all the devices in the beacon radius automatically. The second kind of beacons can thus be managed remotely with ease. Let’s now understand why a Wi-fi+Beacon solution will solve the problem at hand with the former kind of beacons. Such an access point would communicate with the beacons in the area and collect information from them. It will then send the information to the host server. This will allow a business to remotely control and change the properties of all its beacons without sending someone in person to each one of them with a smart device. This would be extremely useful in vast spaces such as stadiums, hospitals, airports, etc., that have more than thousands of beacons deployed. This would allow the access point to provide both internet connectivity to users in the area and to push relevant contextual information/notifications to any user’s smart device like a beacon. In such a case then, you would not need any more beacons in the vicinity of this hardware. So, it would reduce the number of beacons needed to be installed which would, in turn, reduce the infrastructure cost substantially. If a single hardware access point tracks all the beacons and Wi-Fi points in its vicinity, it will consequently collect valuable data from more sources. This would considerably make the dataset richer and provide more business intelligence. The Royal Botanic Gardens, Kew, wanted to increase awareness among its visitors about history and science. They looked into both Wi-Fi and iBeacon technology to make a proximity marketing plan to deliver proximity-based content and engage them in activities. The offer to connect to free Wi-Fi redirects the user to a page advertising Discover Kew mobile app for download. Once this beacon-enabled app is downloaded, visitors at Kew can interact with the beacons. This airport has over 1,000 beacons installed all over the facility and a recently upgraded Wi-Fi network to increase the number of Wi-Fi hotspots which will, in turn, enhance the visitor experience. Users at the airport can use their smartphones and locate their ticket counter, terminal or gate, check their flight information, find restaurants and shops, and locate their baggage upon arrival. As both IoT solutions, Wi-Fi and iBeacon technology develop over time, certain use cases will call for each technology to cater to particular business needs with respect to proximity marketing. However, as customers begin to leverage tools to connect to free Wi-Fi hotspots, businesses should find innovative ways to pair iBeacon technology with their existing networks for more contextually relevant experiences. If this pairing is pulled off successfully, as we’ve seen in the examples above, it will open new doors for both businesses and consumers. It is possible to use beacons without app? Yes, Here you are: http://www.seeketing.com.